1. Tocca Beauty Margaux - I was instantly drawn to this fragrance as soon as I smelled it. Once I reviewed the notes, I knew exactly what drew me in - vanilla. I am a sucker for vanilla based fragrances, and the base notes of this are vanilla and musk. There is still a hint of floral notes with amber, gardenia and violet so I don't completely smell like a holiday candle, and it balances out the fragrance so nicely. This is definitely a more subtle scent for me and is enjoyable to wear either day or night. 2. Atelier Cologne Santal Carmin - Just by the look of the bottle, I knew I was in for a serious scent. This fragrance is bold, warm and absolutely intoxicating. From the first moment I sprayed it on my wrist, I could not stop smelling my arm for the rest of the night. The sandalwood and saffron really lured me in since they are two of my favorite notes, and the hint of dulce de leche was the perfect complement. At an 18% concentration, this is by far one of the longest lasting fragrances I've worn in awhile, yet it stays consistent the entire time while on my skin. It never loses that initial richness and depth that a fragrance has when first applied, and still smells amazing 8-10 hours later. A total splurge but worth every penny. 3. Jo Malone Pomegranate Noir - Pomegranate Noir was the fragrance I discussed earlier that I used many years ago and recently discovered once again. This scent is not for the faint of heart as it is by far one of the most unique fragrances I have ever experienced, but that is what makes it one of my favorites. Its sweet notes of raspberry and plum are juxtaposed with stronger woodsier scents such as patchouli and frankincense making a second sniff always necessary. No one ever picks up this scent and smells it once - it's just too different and unexpected to not go back for another sniff. Every single time I wear this fragrance I get compliments but it wears very differently than it initially smells in the bottle. But isn't that the beauty of fragrance? It doesn't reach its full potential until it gets onto the skin and mixes with the body's chemistry. 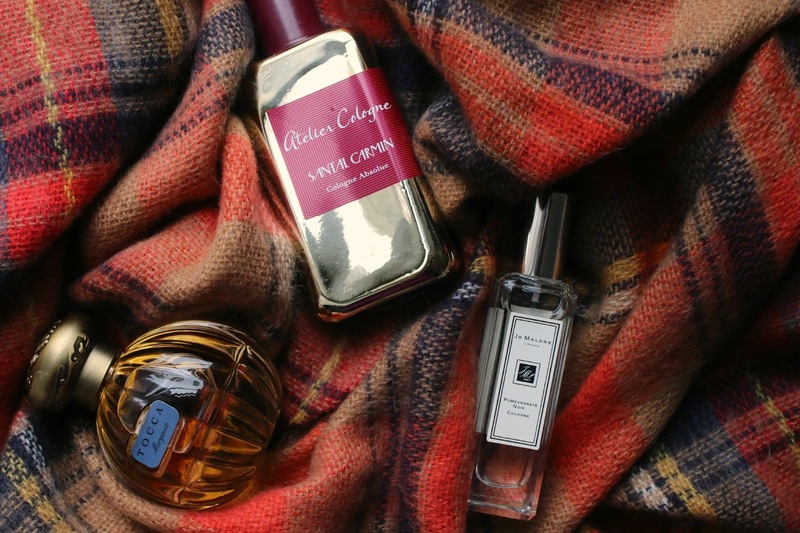 What fragrances are you wearing this fall? I'd love to hear your recommendations!